In closed-basin lakes, sediment porewater salinity can potentially be used as a conservative tracer to reconstruct past fluctuations in lake level. However, until now, porewater salinity profiles did not allow quantitative estimates of past lake-level changes because, in contrast to the oceans, significant salinity changes (e.g., local concentration minima and maxima) had never been observed in lacustrine sediments. Here we show that the salinity measured in the sediment pore water of Lake Van (Turkey) allows straightforward reconstruction of two major transgressions and a major regression that occurred during the last 250 ka. We observed strong changes in the vertical salinity profiles of the pore water of the uppermost 100 m of the sediments in Lake Van. As the salinity balance of Lake Van is almost at steady-state, these salinity changes indicate major lake-level changes in the past. In line with previous studies on lake terraces and with seismic and sedimentological surveys, we identify two major transgressions of up to +105 m with respect to the current lake level at about 135 ka BP and 248 ka BP starting at the onset of the two previous interglacials (MIS5e and MIS7), and a major regression of about −200 m at about 30 ka BP during the last ice age. Recently developed analytical techniques to determine the abundances of noble gases in sediment pore water allow noble-gas concentrations and isotope ratios to be measured easily and routinely in lacustrine sediments. We applied these techniques for the first time to ocean sediments to investigate an active cold methane seepage system located in the South Pacific off the coast of the North Island of New Zealand using 3He/4He ratios determined in the sediment pore water. The results show that more 3He-rich fluids are released in the vicinity of the Pacific–Australian subduction zone than at the forearc stations located closer to the New Zealand coast. However, the He isotope signature in the sediment column indicates that only a minor part of the He emanating from deeper strata originates from a depleted mantle source. Hence, most He in the pore water is produced locally by the radioactive decay of U and Th in the sediment minerals or in the underlying crustal rocks. Such an occurrence of isotopically heavy crustal He also suggests that the source of the largest fraction of methane is a near-surface geochemical reservoir. This finding is in line with a previous δ13C study in the water column which concluded that the emanating methane is most likely of biological origin and is formed in the upper few meters of the sediment column. Moreover, the prevalence of isotopically heavy He agrees well with the outcome of other previous studies on island arc systems which indicate that the forearc regions are characterized by crustal He emission, whereas the volcanic arc region is characterized by the presence of mantle He associated with rising magma. Although the naturally occurring atmospheric noble gases He, Ne, Ar, Kr, and Xe possess great potential as tracers for studying gas exchange in living beings, no direct analytical technique exists for simultaneously determining the absolute concentrations of these noble gases in body fluids in vivo. In this study, using human blood as an example, the absolute concentrations of all stable atmospheric noble gases were measured simultaneously by combining and adapting two analytical methods recently developed for geochemical research purposes. The partition coefficients determined between blood and air, and between blood plasma and red blood cells, agree with values from the literature. While the noble-gas concentrations in the plasma agree rather well with the expected solubility equilibrium concentrations for air-saturated water, the red blood cells are characterized by a distinct supersaturation pattern, in which the gas excess increases in proportion to the atomic mass of the noble-gas species, indicating adsorption on to the red blood cells. This study shows that the absolute concentrations of noble gases in body fluids can be easily measured using geochemical techniques that rely only on standard materials and equipment, and for which the underlying concepts are already well established in the field of noble-gas geochemistry. Sediment samples acquired in 2010 from the long cores of the International Continental Scientific Drilling Program (ICDP) PaleoVan drilling project on Lake Van for noble-gas analysis in the pore water allow determination of the local terrestrial He-gradient as a function of depth within a sediment column of more than 200 m. These measurements yield first insights into the physical transport mechanisms of terrigenic He through the uppermost part of unconsolidated lacustrine sediments overlying the continental crust. In line with our previous work on the spatial distribution of the terrigenic He release into Lake Van, we identify a high He concentration gradient in the uppermost 10 m of the sediment column. The He concentration gradient decreases below this depth down to approx. 160 m following in general the expectations of the modelling of radiogenic He production and transport in a sediment column with homogeneous fluid transport properties. Overall the in-situ radiogenic He production due to the decay of U and Th in the mineral phases of the sediments accounts for about 80% of the He accumulation. At approx. 190 m we observe a very high He concentration immediately below a large lithological unit characterised by strong deformations. We speculate that this local enrichment is the result of the lower effective diffusivities in the pore space that relate to the abrupt depositional history of this deformed unit. This particular lithological unit seems to act as a barrier that limits the transport of solutes in the pore space and hence might "trap" information on the past geochemical conditions in the pore water of Lake Van. The dissolved concentrations of atmospheric noble gases in the pore waters of the ICDP PaleoVan cores are used to geochemically reconstruct salinity on the time scale of 0–55 ka BP. Higher salinities in the pore water at a depth of about 20 m suggest a significantly lower lake level of Lake Van in the past. A sediment core has been sampled at a spatial resolution of about two centimeters for noble-gas analysis of the sediment pore water. 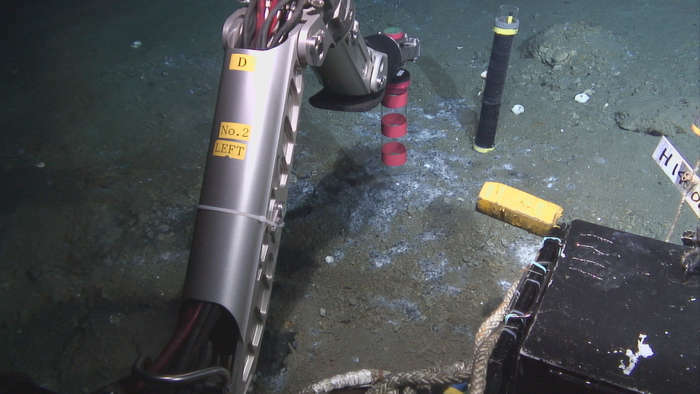 This high-resolution sampling allowed an excess of dissolved atmospheric gases to be identified in the pore water at a sediment depth of 40 cm. Sedimentological evidence indicates that the observed gas excess is related to a past mass movement that trapped and conserved the gas surplus for more than a century. The measured noble-gas concentrations support the hypothesis that, depending on the sediment texture or particular structures in the sediment, the transport of noble gases in the pore space can be significantly attenuated compared to molecular diffusion in bulk water. The atmospheric noble-gas abundance in the pore water allows the deposition of sediments originally located near the air/water interface to be identified. Although the nature of the physical processes that limit the fluid transport in the pore space could not be fully assessed, our observations indicate that noble-gas concentration profiles can be archived for unexpectedly long times in specific sedimentary sequences. This finding represents a significant step forward in the interpretation of noble-gas concentrations in sediment pore waters in terms of past environmental conditions.